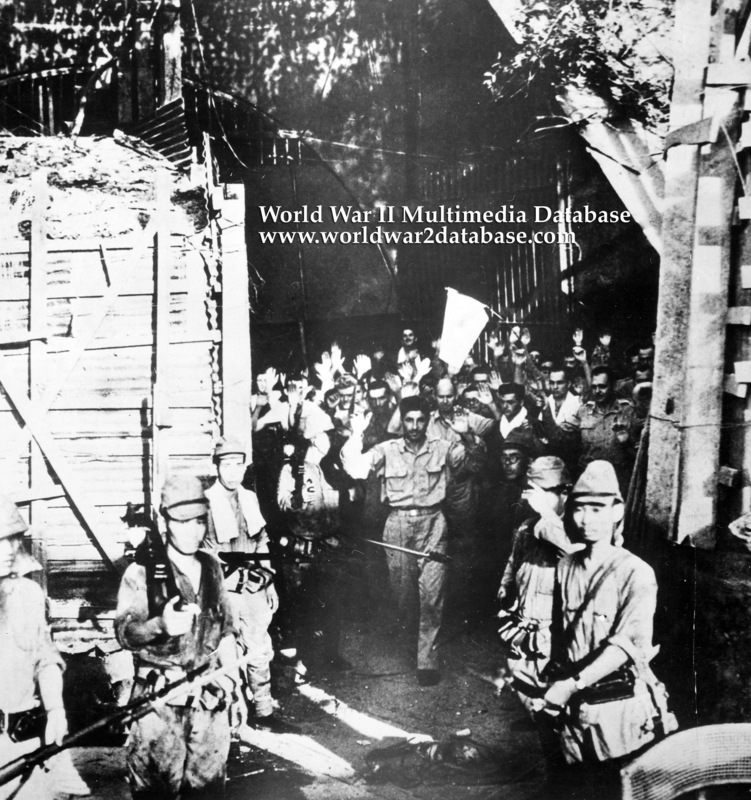 American Prisoners of War, retained after most of Corregidor's 11,000 defenders were moved off the island, are forced to reenact the surrender of Malinta Tunnel. This is the East Entrance of Malinta. Much propaganda was made about the surrender of the Philippines. The Japanese kept two work parties on the island, one held at the lower level of the hospital to replace a 12" gun tube at Battery Hearn and to use parts from Battery Chicago on Morrison Hill to fix the damaged Battery Ramsey's 6" guns. Battery Ramsey was completely destroyed by the American liberation in 1945. The second work detail, probably shown here, collected scrap metal for shipment back to Japan. The Prisoner of War camp began with 240 men that the Japanese retained on the island after shipping the other defenders off island by May 23, 1942. The men were in various quarters on the island but no single camp for the entire war. An additional 76 officers and enlisted men arrived from Cabanatuan on June 7, 1942. Senior officer was Lieutenant Colonel Lewis S. Kirkpatrick. The hospital was moved to Bilibid Prison in July 1942, and 66 men were removed to Manila in October. The men were paid for the first time in October 1942 and received Canadian Red Cross packages for Christmas. Because of the availability of hidden food stores and supplies coming into Corregidor for shipment to Japan, the men were relatively well fed during their time there. The Japanese did not favor the leftover American stores of corned beef and stewed tomatoes, which supplemented the prisoners' diet. That changed for the Americans when they arrived at the Bilibid Prison Camp and when they were shipped to other camps in Manchuria and Japan. Kirkpatrick died of pneumonia on April 27, 1943. All American prisoners on Corregidor were moved to Bilibid on June 8, 1943.